What was this “Science Dystopia” badge she spoke of? It was a real treat to have Margaret Atwood out to UBC last night, and she was a delight to host from start to finish. 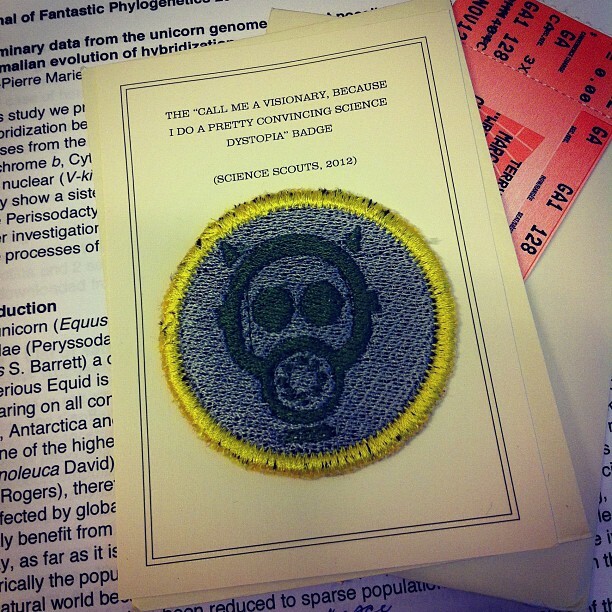 At the beginning of her talk, she made mention of a science badge – a “Science Scout” badge – and I thought it would interest some folks to share a bit more on her nod to this unconventional thing that came from my lab. Essentially, a while back, she was kind enough to help design a Science Scout badge. What is a science scout badge exactly? Well, it’s one of those things that goes a long while back, and is usually best left unexplained – except to say that searching the internet will get you there. In a nutshell, the badges are a silly thing, if not amusing, but also a portal into science culture. Usually, these badges are virtual stamps to leave on one’s website, or an opportunity to tell an interesting science story. And on occasion, we do have talented folk who make physical incarnations of them. 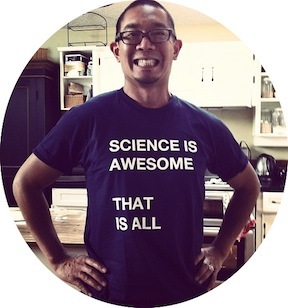 More importantly, I think it’s another great example of science culture. It’s another instance that shows that it’s o.k. for a writer like Margaret Atwood to participate in science things (obviously) – likewise, it’s o.k. for a scientist like myself to participate in storytelling things. It’s really not that strange. Science isn’t a technical term – it is a form of culture. It’s also a tool or a way to understand and experience the world. And as such, it can be embedded into everything, in large or small parts, technically or philosophically, and we shouldn’t be afraid of it. Perhaps we should be wary of it, but not afraid of it – these are not the same thing. If nothing else, it seems to be a pretty good inspiration for badges.